Extension Unit. Works with any phone device. Turns any electrical outlet into a phone line. Easy to move, remove, and take with you anywhere. 625SA E Ivory. In The U.S.A. Single gang size and all-in-one design. 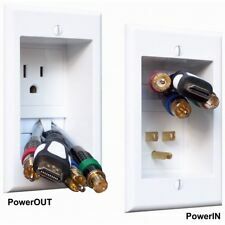 Designed to simplify wiring behind wall-mounted flat-panel TV's. No wiring, simple snap together PowerConnectors make this safe and easy. Partner a SBCK kit for your soundbar power or use a CKRE if you need longer in wall power wire. Bitte lesen Sie vor dem Kauf des Artikels "REV Ascoli weiß/gelb TAE-Dose Telefon-Dose Dose inkl. Rahmen 928104" die vollständige Artikelbeschreibung durch, um mehr über Zustand & Lieferumfang zu erfahren und um Fehlkäufe zu vermeiden!. 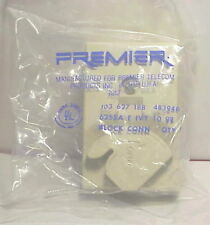 RCA TP062R Telephone Phone Coax Wall Jack Plate, Almond, New! 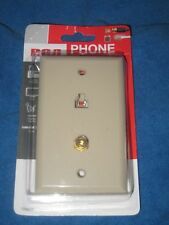 RCA TP062WHR Phone Coax Wall Plate. 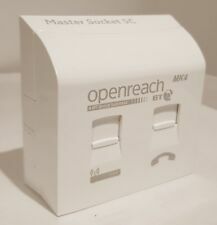 This is a Genuine BT OpenReach product with logo as shown in the picture. Happy to help ! BT NTE5a Master socket. FREE Back Box ! Die hier angebotene RJ45 Dose für ISDN & Cat.5 ist ein Bestandteil der Elektro-Installationsserie „DELPHI” in silber. Diese Serie beweist, dass Eleganz und Qualität nicht teuer sein müssen!. Boxed Krone 100 pair box connection 301A. 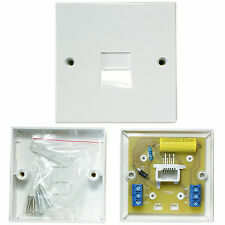 High speed VDSL2 faceplate filter and NTE5 socket kit! RJ12 6 Position 6 Conductor (6P6C) Modular Plug Flat Wire. £0.99 RRP: £1.99 : You Save £1.00. Stand & Cases. Compatible with 2, 4, or 6 Wire Cables. Music & Musician. I will say that one of the main reasons to buy from us is that we are honest and care and we are here to provide a service as well as a product. One takes a 4 prong plug, made by Radio Shack. Another is marked 103A. BT Heavy Duty External Telephone Bell 80D "BRAND NEW IN BOX"
The bell gives off a ring of 80 decibels. There is no wire supplied with the bell it has to be hard wired to a socket. The height of the bell is 185mm, the width is 150mm at the widest point, the depth is 120mm. YOU WILL NEED THE RTX MASTER PLUG FOR THIS UNIT TO WORK AS A SLAVE. Wireless extension unit for the RTX wireless phone jack. These are for use with the standard flat fronted NTE5a socket only. with BT Openreach type NTE5a master sockets (not included). VDSL2 BASED INTERNET CONNECTIONS. VDSL2 filter performance is compliant with SIN498. Part number; 1497339. Ford Fiesta 2008-2012. Ford Focus 2008-2011. Ford Focus Cabriolet 2006-2010. Ford Kuga 2008-2012. 20 genuine Kauden 22mm deep back boxes are included in the box. internal bell wire filter for improved ADSL/vDSL speeds! 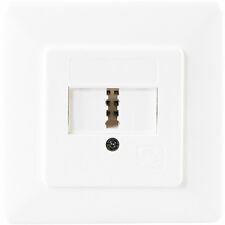 The direct plug in VDSL2 faceplate filter replaces the normal. VDSL2 BASED INTERNET CONNECTIONS. VDSL2 filter performance is compliant with SIN498. The faceplate is backward compatible to work with standard ADSL also. 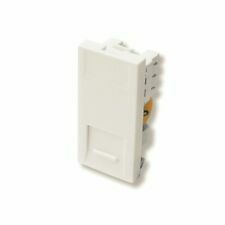 The Solwise ADSL Filtered BT/RJ11 Faceplate is suitable for those who wish to have an integrated ADSL. Two separate sockets for your Phone and ADSL connections. Your ADSL modem needs a ‘raw’, un-filtered signal, either from the incoming signal at pins 2&5 or from the ‘modem’ connection on the front of Your ADSL point. ADSL Surge Protector. with this ADSL surge protection kit. ADSL Surge Protector Kit includes 1x RJ-11 Plug to BT Socket Leaded adapter and. CHANNELL 14000 Series Fibre Optic Dome Closure 12 Fibre 4 Round 1 Oval "NEW"
The 14000 Series Splice case accommodates up to 12 Fibres' on a splice tray cassette. It is ideal for low fibre count applications such as HFC nodes, FTTC ONU's, building interface and campus/LAN applications. Why an NTE5?. The NTE5 type master socket, allows easy testing of the BT network by removal of the front faceplate to reveal what is known as the test socket. This is a Genuine BT OpenReach product with logo as shown in the picture. 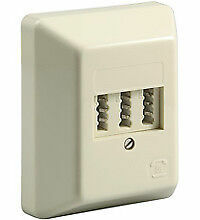 GE (GE926) Wireless Plug in Phone Jack System - Base Unit Extension Jack. New & Sealed. POS SINGLE PORT. UN SHIELDED 6. LOT OF 590 ~ NEW. PHONE JACK. Be sure to check out the provided photos. “HI TECHNOLOGY BUYS”. EXCELLENT CONDITION! This Wireless Phone Jack System is New in Package. Thank you for your interest in this Item. Everything comes from a smoke and pet free environment. Shipping is always every week day and almost always on Saturdays. There is a 60 day money-back guarantee on all listings. Please message any questions, as they will be answered in a timely manner. Thanks for your time and confidence. Turn any electrical outlet into a phone jack with this product. This is a Genuine BT OpenReach product with logo as shown in the picture. Connector: 2x RJ11. Color: Beige. The output is 85db - 105db, it is set at the maximum but you can change it via a screw inside. 1x Kauden NTE5a master socket rear section. with screws, back box, IDC insertion tool and high quality Kauden VDSL2. The direct plug in high quality VDSL2 faceplate filter replaces the. ADSL AND VDSL2 BASED INTERNET CONNECTIONS. 20 X GENUINE KAUDEN BT MASTER SOCKETS (BOXED). 20 X GENUINE KAUDEN BACK BOXES. This is the latest revised version by Kauden for 2019. 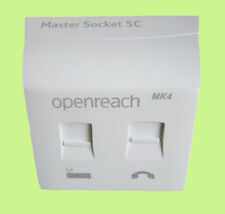 Lower front part is identical to Pressac lower front part and can be replaced on an existing Pressac Openreach Master Socket. Vanco MTP4S (Lot of 100 plugs) Clear RJ-22 Telephone Handset Plugs For 4 Conductor 4P4C Wire Used on Modular Corded Handset to base telephone Quantity: 100 Color: Clear Generally used to connect the handset to the phone body RJ22 for 4P4C wire. DO YOU MISS THOSE IMPORTANT PHONE CALLS BECAUSE YOU DON'T HEAR THE PHONE RINGING?. Fully tested and password reset to default. I now believe myself to be conversant with how to alter the wireless settings even if the plug has different ideas! If yours were not fiddled with and have the default settings this should pair automatically. This ADSL Filter is designed to exceed the BT SIN 346 specifications to ensure maximum compatibility. No need for external filter. 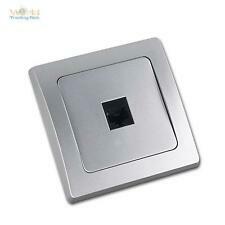 Flush fitting face plate replaces existing wall plate. Wire Gauge 24-26 AWG. Housing Material Polycarbonate (PC). Color Translucent - Clear. 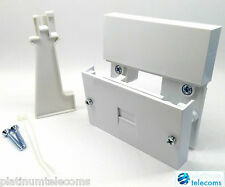 GE (GE926) Wireless Plug in Phone Jack System - Base Unit + Extension Jack!